Good news for the DC metro area as February market statistics show year-over-year (Y-O-Y) increases in all categories – sales, prices, new contracts, inventories, and days-on-market, according to the RealEstate Business Intelligence (RBI). The word “increase” seems to be the most prevalent one in the report, so buyers and sellers should both be happy! Several Y-O-Y statistics have had three or four months of increases in a row, and this momentum is expected to continue as the spring selling season approaches. Closed sales increased year-over-year for the third month in a row, with townhomes taking the lead with 12.8% compared to February 2014; and an 11% increase since January 2015. This is the strongest February in two years, and it is the first time since October 2013 that there have been three consecutive months of increases. Year-over-year contract activity for all property categories increased for the fourth straight month, with single-family detached homes taking the lead with an 11.1% increase since February 2014. Overall contracts are at the third-highest level since February 2006. New contracts for condos, however, had a weak increase of 0.4%. Sales prices were at highest level since 2007, and townhomes and single-family detached homes had the strongest increases. 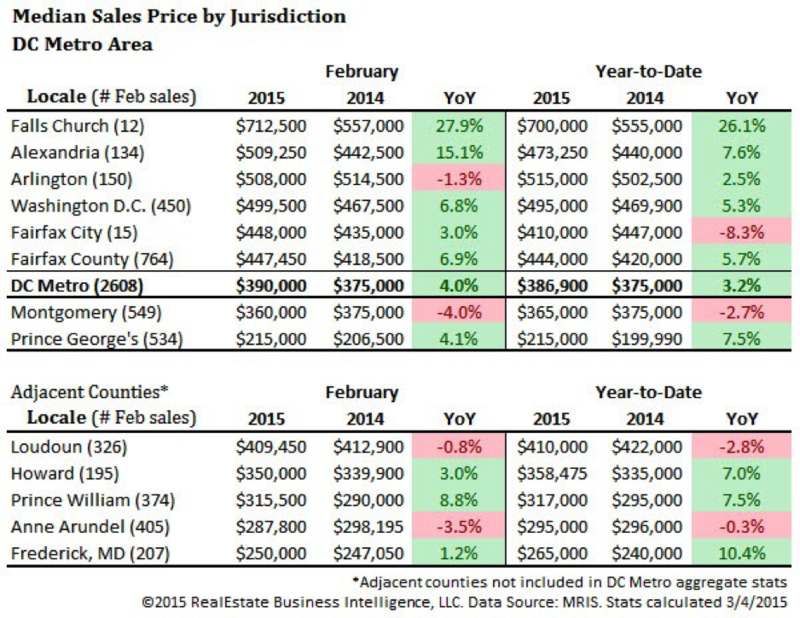 The median sales price in the DC metro area was $390,000 — a 4% year-over-year increase. Most jurisdictions saw a price increase except for Arlington County and Montgomery County. Active Listings — All property categories saw an increase in the number of active listings, and the February market stats showed 17 consecutive months of continued growth. There were 8,176 active listings at the end of February, a 16.6% increase from last February. There have been 14 straight months of year-over-year increases in all inventory types, the first time in 10 years. Condos led the growth in active listings with 19.9%. New Listings — The metro area has a 12% increase in new listings compared to last February. New listings for townhomes increased the most with 16.7%, followed by single-family detached homes with 11.8%, and condos with a 7.8% increase. This February saw a two week increase in days-on-market (DOM) at 42 days, but was three days lower than January 2015. The District had the shortest DOM with homes selling in less than 3 weeks. Prince George’s County was the next fastest, with a median of 30 DOM. Condos saw a 72.7% increase with 38 DOM, detached homes increased to 54 days, and townhomes increased to 31 days. Stay ahead of the crowd and tune in each month for our updates on the markets in DC, Maryland and Virginia!